The shaded patio at Restaurant Zoë is perfect for a sunny afternoon drink. Considering the delightful weather of late, we’re going to feature al fresco happy hour each week for the rest of summer. I know what you’re thinking: Shouldn’t we be writing about bars with AC instead? Blasphemy! Our summer, in all of its daylight glory, will be reveled roofless or on a rooftop, preferably with a shandy or slushy in hand. Our social contract with Seattle demands it. Don’t worry, though, we’ll feature happy hours that won’t feel like a sauna — maybe under a parasol or in the shade by the water — but it will certainly be outdoors. The tried and true will be crowded. So we’ll focus on some under-the-radar patios and new spots instead. First up: Restaurant Zoë on Capitol Hill, with its garden patio fragrant with lavender in one corner and jasmine in another, along with a bounty of bay leaves, berries and edible flowers that get incorporated into Scott Staples’ Noveau American menu. This shaded oasis feels like a sanctuary where you could imagine literary figure A.J. Liebling cooling off on a quiet afternoon, under the reaching maple tree with a bottle of Alsatian white. With its arboreal covering, Zoë’s patio feels 10 degrees cooler than the sidewalk on the other side of the iron gate. Even better, the bistro sits far enough from the rowdiness of the Pike/Pine Corridor that you won’t have to strain to hear your party or worry the patio will be overrun by the PBR crowd. It’s an ideal date place for couples on a budget. Happy hour features discounted appetizers from the dinner menu. Beef tartare ($8) is a good choice, rounded out with a copious helping of fries ($4) to share. 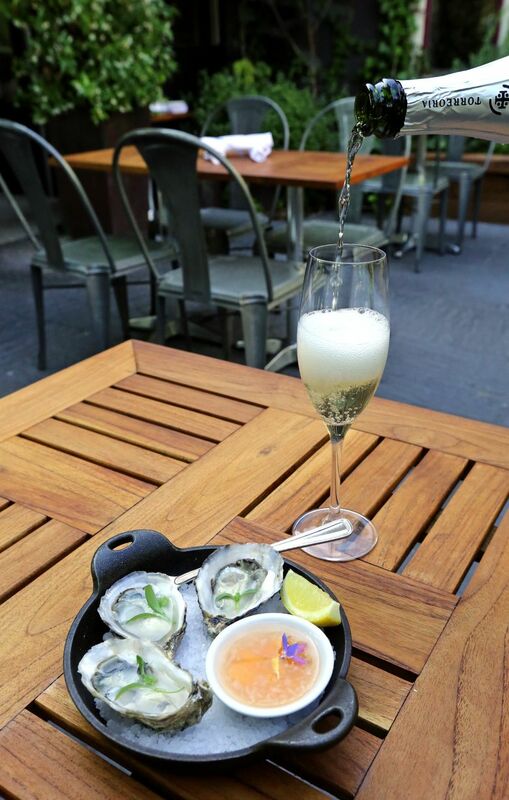 And this being summer, try something light, perhaps a dozen oysters ($1-$1.75 each) paired with a Muscadet ($5)? Or sit in the corner, smell the flower nectars, sip rounds of $5 cava and laugh with your friends well into sunset. To paraphrase Liebling, it’s medication he would have prescribed. Restaurant Zoë, 1318 E. Union St., Seattle, offers happy hour daily 5-6:30 p.m. with half off oysters, $3-$8 appetizers, $5 wines, $4 well drinks and $3 draft beer (206-256-2060 or restaurantzoe.com).